Cedarville University is a beautiful campus, but it takes a lot of work to keep it that way. The custodial staff at Cedarville cleans over a million square feet of the Cedarville campus daily, and with more than 3,500 students and 200 faculty members on campus to clean up after, the 24 full-time custodians are gainfully employed. Most people are not eager to clean up after themselves, let alone a few hundred other people. However, the custodial staff does this every day. And their job continues through the summer months, too. This article describes just a few of the many people in this department to provide some insight into the faithful caretakers of Cedarville’s campus. Matthew Phillips, manager of Custodial Services, has worked for Cedarville since February 2011 and was promoted to manager in August 2014. Phillips said he heard about the custodial job while at Grace Baptist Church in Cedarville and applied for a custodial position after his management job for a company in Centerville was eliminated. Phillips said he enjoys working to keep the campus clean and safe for the thousands of students and visitors. Since he took over as the manager for Custodial Services, Phillips said he has tried to eliminate the use of harmful chemicals and make the cleaning process more organized. Phillips grew up in Bellbrook but now lives in Cedarville. He has two daughters, Koyri, 13, and Karsyn, 8, from a previous marriage and is currently engaged. He met his fiancé, Janine Mitchell, when she was working as a custodian. She has since gotten her degree and is a registered nurse. The couple is getting married in September 2016. Trinity Powers started working in Custodial Services in December 2013. Powers’ uncle, Mark Haldeman, who is the manager of mechanicals systems at Cedarville, was the one who recommended she apply with the custodial staff. Powers said she likes the students at Cedarville, but what she enjoys most is working with Dora Policy and Higinia Sanchez in Custodial Services. Powers’ husband Tim is a senior broadcasting and digital media major at Cedarville, and they were married last May. Powers said she met Tim when she was 14 and one of her sisters was dating his brother. Her sister eventually married his brother, and Powers said that for a long time she was just friends with Tim. Powers said that gradually their relationship changed, and they started dating a few months before she started working at Cedarville and married a year later. Powers is originally from Canandaigua, New York, but she moved to Washington Court House, Ohio, when she was eight years old. She has four sisters and one brother. 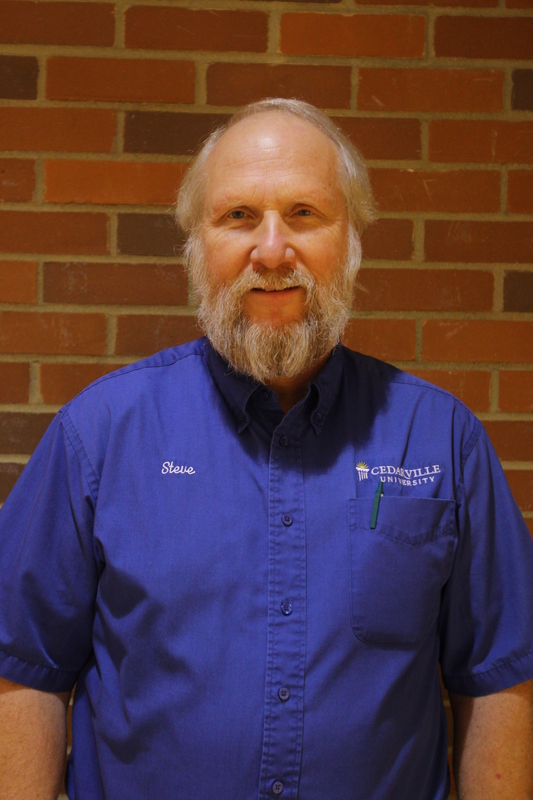 Steve Miller has worked for Cedarville since 2006, although he began work at Cedarville in the Advancement division, which keeps up with alumni and donors of the university. When the division was restructured in 2008, Miller’s position was cut, but he was later offered a place in Custodial Services. Miller graduated from Cedarville in 1979 with a major in biology. He said he met his wife, Elaine, while attending an embryology class at Cedarville. Miller said he and Elaine were married a week before they graduated, and the couple is now enjoying their 37th year of marriage. Miller’s wife also graduated with a major in biology and has worked as a respiratory therapist for 39 years. Miller and his wife have two daughters. The oldest daughter graduated college in 2012 and is married, and the youngest daughter is currently a part-time student at Cedarville studying graphic design. Miller said he enjoys working with his coworkers and likes it when students recognize him and stop to talk. He said the appreciation he gets from students means the world to him. 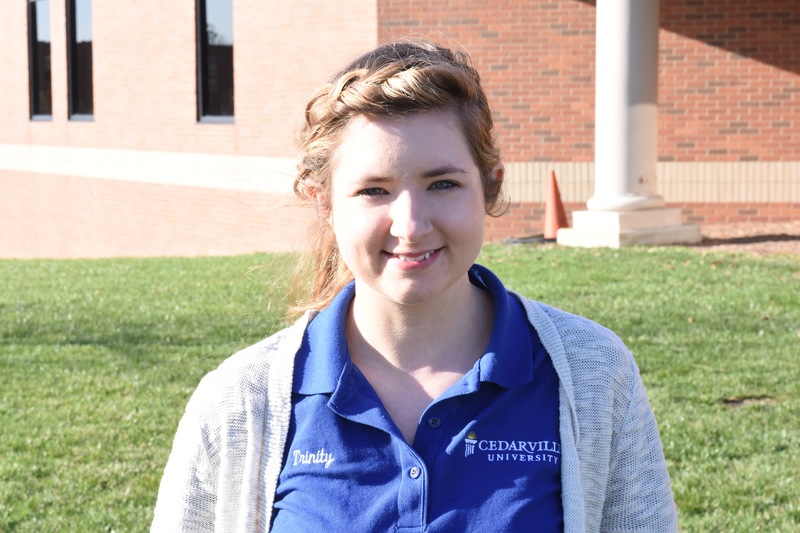 Kearsen Wideman, assistant manager of Custodial Services, started working at Cedarville in July 2011 and was promoted to assistant manager in August 2015 under Phillips. Wideman said she had her own cleaning business when she visited campus for a CU Friday with her oldest daughter in 2011. Wideman said she decided to apply for a job to help pay for her daughter’s tuition, but her daughter, Kayleigh, was initially against it. “At first my daughter was like, ‘No way, you can’t. You’ll be the helicopter,’” Wideman said. However, Kayleigh, who graduated last year with a degree in applied communications, relented. Wideman’s second daughter, Kimberlyn, is now a freshman social work major at Cedarville. Wideman’s husband, Barry, is a social worker at the Dayton VA hospital and an adjunct professor of social work at Cedarville. Wideman said she enjoys spending time with her daughter at school and seeing her husband around campus. Despite the 30-mile commute from her home in Dayton, Wideman said she loves her job because she enjoys getting to know the students. Wideman said she loves the opportunity she has to minister to the students, and during breaks in the semester she and her husband often give students rides to the airport. 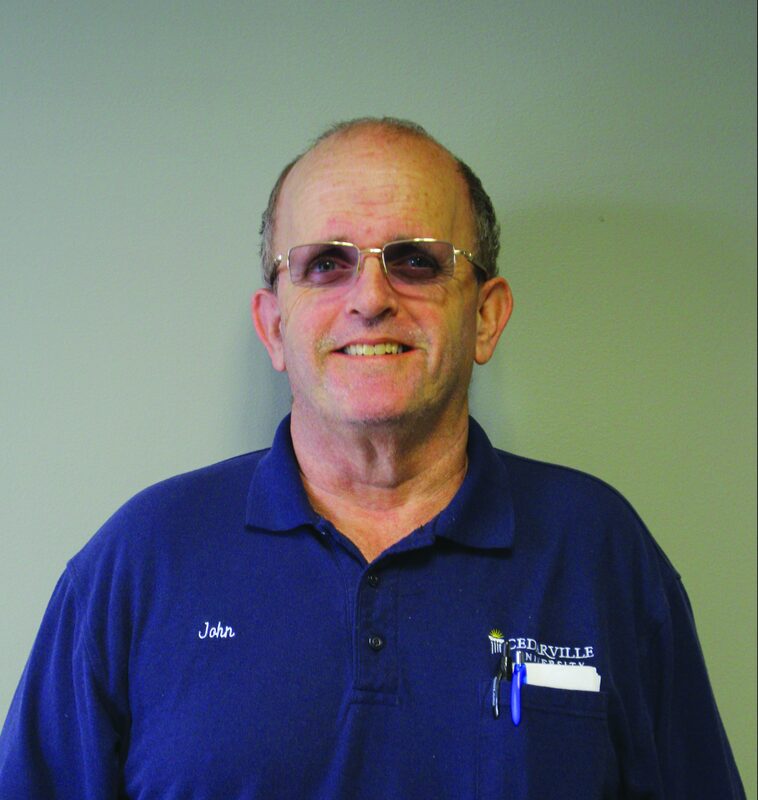 John Frazier has worked for Custodial Services since 1987, although he said back then the department was called “Housekeeping” and was made up of all women. Frazier said the manager at the time, Betty Tarter, was not sure he would stick around. He is now in his 29th year at Cedarville. Frazier is unmarried and lives in Fairborn, where he has lived for most of his life. Before coming to Cedarville, Frazier worked as a cook at a seasonal restaurant called Apple Tree. Frazier got a two-year degree in food service from Greene Joint Vocational School in Xenia and enjoyed working as a cook. However, he said he wanted a more stable place of employment, and his boss at the time recommended he apply for a job at Cedarville. Frazier said he applied for a cleaning position because he did not want to work in a cafeteria. Frazier said he enjoys working around the students and meeting the parents. He said he wants students to feel at home at Cedarville and joked that messy students provide job security. While they love the students, custodians said students picking up after themselves and courtesy flushes make a huge difference. Keegan D’Alfonso is a freshman journalism major and a reporter for Cedars. He was a sergeant in the Marines and enjoys learning about and experiencing other cultures. No Replies to "Caretakers of the Campus"